The Giving Grove is a hands-on learning environment where students learn about orchards — from planting and maintaining the trees to eventually picking fruit off them. 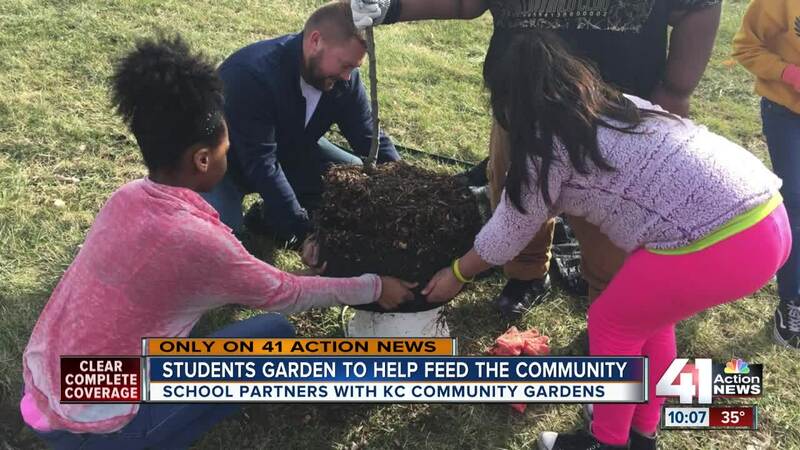 Kansas City Community Gardens is looking for other schools that would like to start their own Giving Grove. GRANDVIEW, Mo. — Outside Grandview Middle School, ideas are growing. A sixth-grade science class is working in the school's Giving Grove, a hands-on learning environment where students learn about orchards — from planting and maintaining the trees to eventually picking fruit off them. "I helped with some of the trees, I helped with the barrels and bringing them to other people," Grandview sixth-grader Zieron Horton said. Science teacher Jeff Gresnick said having the students work in the orchard "makes it more real to them." "They get to get out and see things and put things in their hands instead of just reading out of books," he said. Gresnick's class planted 12 fruit trees in December as part of a partnership with Kansas City Community Gardens (KCCG). "We have seen the children get really excited about learning how to grow the trees," Giving Grove CEO Robert Reiman said. "We have seen them get really excited about eating peaches and pears from the orchard." In about three years, Grandview Middle School's orchard will be ripe with apples, as well as European and Asian pears. Students will be able to take home the fruit. "It's really hard to imagine what it's like in a classroom when you come with an empty stomach," Reiman said. KCCG is looking to partner with other schools that have free and reduced meal populations of more than 40 percent. Through this program, schools will have the ability to create local food systems that will generate thousands of pounds of fruit. Schools that want to apply need to fill out a form . "This is just one way to provide free, healthy food, but more importantly, teach children they can do it themselves. They can start here and it can end up in their backyard," Reiman said.